‘UAVs for Disaster Management’ by IIT Madras emerged winner of a challenge under Microsoft’s Academia Accelerator programme here on Tuesday. The award winning project aims to solve the issue of lack of systems for accessing accurate information by creating an end-to-end autonomous system, to provide precise information about where exactly the people are stuck, with the use of UAVs which are powered with AI and Computer Vision. Microsoft India today hosted AXLE, a Microsoft Academia Accelerator an annual showcase of collaboration between Microsoft and academia. 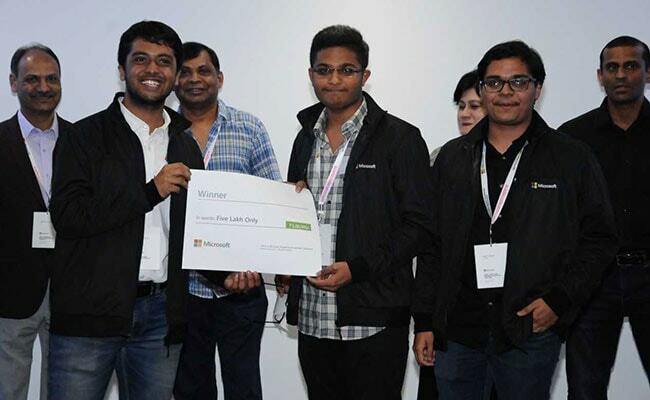 For making a Mixed Reality app that makes basic tasks like communication, navigation and current status monitoring easy for rescuers, the team from IIT Guwahati was judged the first runner up in the competition, Microsoft said. The IIT Jodhpur team’s Internet of Things (IoT)-based solution that acts as an early warning system and takes precautionary measures on detection of disasters was placed third in the competition. The three winning teams will be awarded Rs. 5 lakhs, Rs. 3 lakhs and Rs. 1 lakh respectively, Microsoft said. The winning teams will receive technical and educational support through the AI for Earth grantee community and each winning team will also be awarded $5,000 in Azure credits from AI for Earth. Launched in July 2017, AI for Earth is a $50 million, five-year commitment from Microsoft to put AI at work for the future of the planet. Academia Accelerator Showcase builds on the best through mentor support, publishing support and pitch support provided and eventually provides the opportunity for the best among India’s student developers to hone their CS skills further. “Academia Accelerator aims to provide insights to students about important technology trends and practices and adding industry know-how to the existing Computer Science curriculum,” said Chitra Sood, Director Business Management, Microsoft India (R and D) Private Ltd.